Mizzou had a difficult time slowing down Auburn’s Tre Mason during the SEC title game, but the men in black and white had a much easier go of it Saturday evening. In the wild shootout that was Auburn vs. Mizzou, the Tigers running back ran for 304 yards and four touchdowns. Mason rushed his way into the record books, breaking the SEC Championship’s single-game rushing record, as well as the record for most carries, eclipsing Jamal Lewis’ 31 set in 1997. Mason had himself a day, but his numbers might have been even more staggering if it wasn’t for a certain official who helped out the struggling Mizzou defense by nailing Mason with an accidental elbow to the chest, stopping him dead in his tracks. It was one of the few times Mason was taken out on Saturday, as he and his Auburn Tigers steamrolled their fellow Tigers, 59-42, to win the SEC Championship. 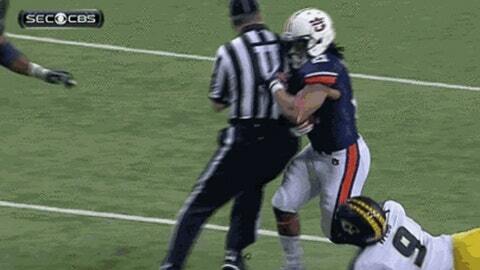 Check out the massive hit by the referee in the GIF below, with a fist bump to SB Nation.